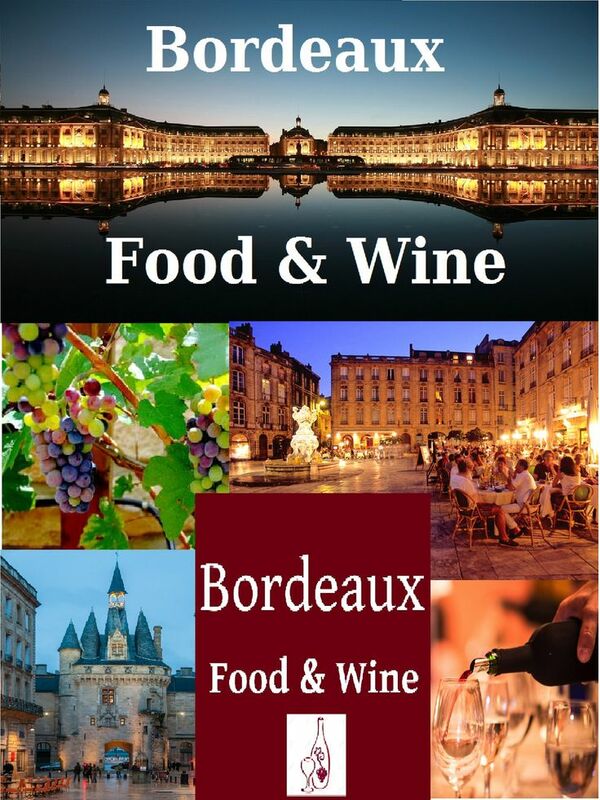 #ParisFoodAndWine APP It’s like having a concierge at your fingertips! Join in directly on our FB page: And remember to like our page and share, too! 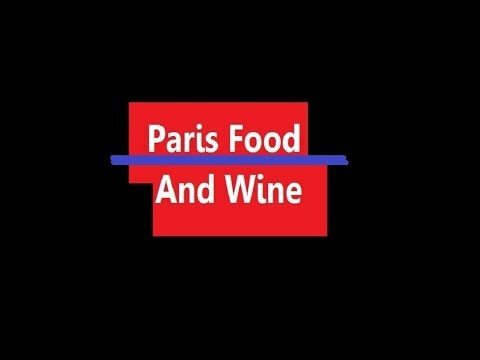 Episode 14 Paris GOODfood+wine Happy Valentine’s Day From Paris! 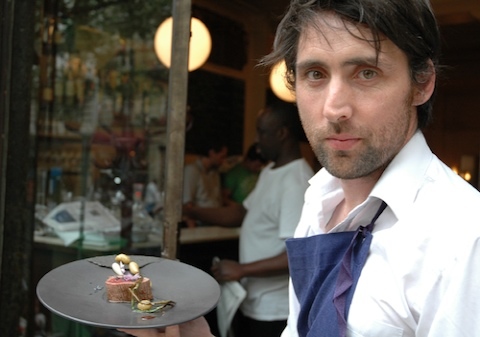 This year Chef Inaki Aizpitarte’s Le Chateaubriand made it into the Top Ten of the World’s 50 Best list. The dinner choice is Prix Fixe and no one has ever complained. If you have one restaurant to try when you are in Paris, this is a Winner! 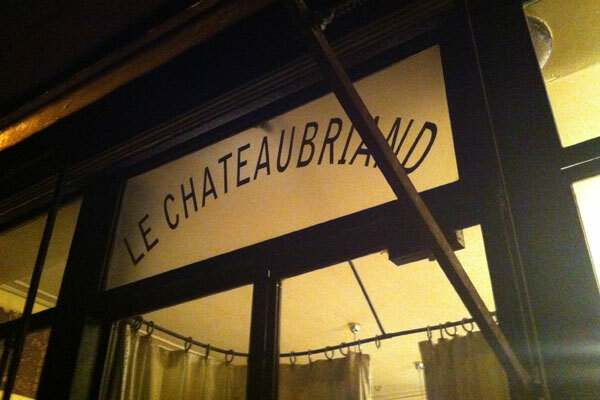 In 2010 Le Chateaubriand was #11. 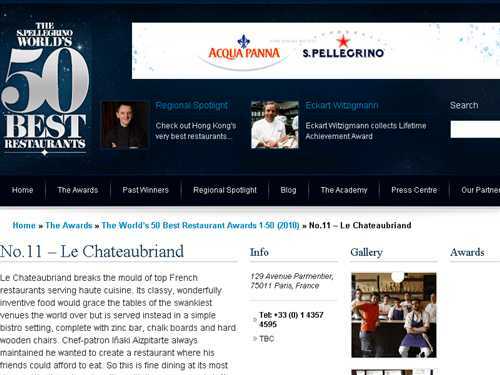 In 2011 Le Chateaubriand is #10 on the 50 Best Restaurants in the world list. Paris is catching on to a wildly popular UK dining custom called “Secret Dinners.” In certain parts of the U.S., such as L.A. and NYC, they are popular, too. Essentially, they are moveable feasts where the people, the food and, most importantly, the locales are never the same. Parisian foodies will nod and smile and confess that they have no idea why the Secret Dinner trend hasn’t quite taken hold in their city. It might be partly because when you do a search on the internet under Paris Secret Dinners this huge article of a catacomb tribe who held seances (not really, much tamer than that, but it’s fun to spread these blasphemous rumors, isn’t it!?) in the secret tunnels below the Trocadero surfaces. 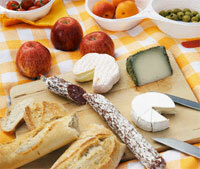 In Paris there are a few who are carrying on the UK tradition of Secret Dinners and Secret Lunches. One goes by the name New Friends Table and another by the name Miss Lunch. Neither wanted their photos published or even too much written about them, given that it’s all, well, you know, Secret! The concept is a good one for travelers or transplants to a new city. Anyone can eat out at a restaurant, but how often do you get the chance to be invited to someone’s home where you can share a meal, meet other people, talk to locals, and generally get an authentic glimpse into how people live in a given city. Well, you might, if you have an old college roommate or a cousin living in a foreign city, but if you’re off for a romantic weekend or on business overseas for a week, you likely won’t get that opportunity. As a single woman, it provoked some thought to agree to attend a Secret Dinner where an address isn’t provided until a few hours before the start time and where you must swear to secrecy about the identity of the people putting on the dinner. So when a Secret Picnic was alternately proposed, I felt confident that this was the better choice. 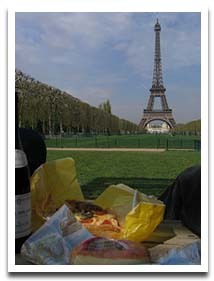 Sunshine and spring weather on a Saturday afternoon in a Paris park is paradise on Earth. Add to that a picnic basket filled with some of the best delights Paris has to offer, in the form of cheeses, bread, wine, olives, chocolate, traiteur salads and cold dishes, and a couple of outrageously decadent desserts all delicately spread out on a colorful flower tablecloth on the grass and you’ve got yourself a Picnic a la gourmand…secret or not. Sightseeing is tiring. And while shopping for cheese and wine can be fun, you might not know where to get the best stuff when you’re in Paris for 72 hours. 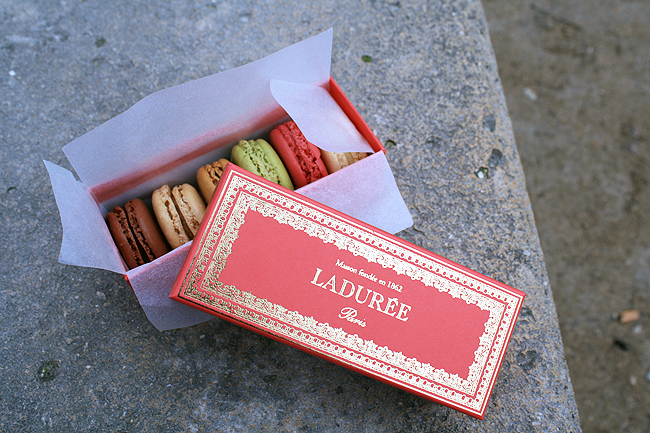 It’s also time consuming to make the pilgrimages to the various arrondissements to gather the truly famous goods. 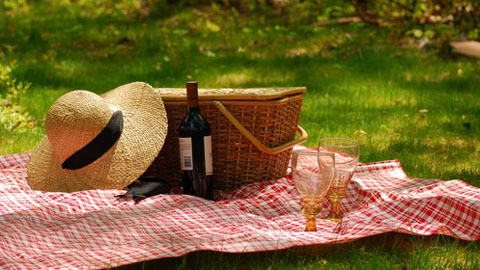 You have the option of either joining in on a Secret Picnic already planned or you can order your private picnic for two, as you desire. Now you’ll just have to try to figure out who the Secret Picnic people are. Good LUCK! Hint: they arenot in the catacombs under the Trocadero. Picpoul-de-Pinet, cultivated on the French coast of the Mediterranean Sea, pairs perfectly with fresh, chilled oysters, prawns and other seafood. Picpoul de Pinet, also spelled Piquepoul de Pinet, is both a rare white French grape varietal that thrives in the South of France and it is a designated appellation with its own A.O.C. classification in an area that hugs the Thau Lagoon between Sete and Agde in the Languedoc-Roussillon region of Southern France. This fresh, crisp wine that splashes hints of lime and green apple in the mouth pairs beautifully with seafoods. It accents especially well the oysters and fresh prawns that grow in abundance off this Languedoc coastal region and the Thau Lagoon where the sun-loving, late-blooming grape thrives and where it enjoys its own Languedocian regional appellation. Piquepoul, the grape varietal, is used to make the light acidic wine called Picpoul de Pinet, with floral and citrus fruit aromas. 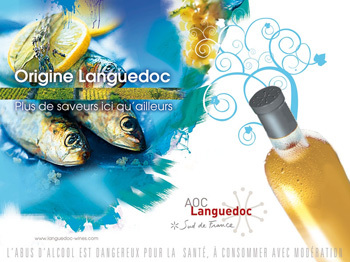 It follows then, that the AOC Coteaux du Languedoc, Picpoul de Pinet classification, applies only to white wines. This rare, ancient French grape thrives in the coastal sands near Sète in the Languedoc, the fishing village that affronts the Mediterranean Sea. The refreshing acidity of this full-bodied wine pairs especially well with seafood because of its more floral, citrus and peach flavors than the minerality of a Sancerre . Picpoul is mostly enjoyed by Languedociens or tourists visiting the area, at present, and is not yet exported as much as say, another rare French varietal, Viognier. This clear, light-gold wine breathes appetizing aromas of peaches, juicy and fresh, with a back note of lemon-lime. Crisp and tart, white-fruit flavors and lemon-squirt acidity are fresh and cleansing in a very long finish. Not overly complex but bright and appealing, it’s a first-rate seafood wine. It has been called the Muscadet of the south of France. It is the wine that is usually served with oysters that can be found along the coasts of the Languedoc. Objective: Acquire a delicious Pouilly Fumé for our operatives. The central vineyards of the Loire Valley is Sauvignon Blanc country with arguably among the best examples of the varietal being molded into the world’s best wines. The Pouilly Fumé appellation sits on the eastern side of the Loire River across from Sancerre. The wines of Pouilly Fumé must be 100% Sauvignon Blanc and like its brethren from across the river are heavily influenced by the Terroir with its limestone, flint and marls composition. Look – Crystal clear light pale straw yellow with subtle green hues that becomes clear water pale along the edges. When swirled, the slightly springy wine clings to the side of the glass before forming legs that descend to the wine below. Smell – Medium in intensity with bright and fresh aromas of citrus and green tree fruit with mineral notes of wet stone, and hints of subtle herbs and white flowers. Feel – Smooth, with good weight, this medium bodied wine’s fresh fruit provides a slight touch of sweetness. Dry and crisp otherwise, with lively but balanced acidity. Taste – Fresh and tart citrus and green fruit, specifically Meyer lemon and lemon creme and green apple is layered over slate and wet stone and steely gun flint minerality and touches of herbal grass. Finish – Clean, refreshing and crisp, this wine’s vibrant acidity, steely minerality and good weight holds the fruit and other flavors perfectly as it gently fades and begs another sip. Conclusion – The 2007 Domaine Bouchie-Chatellier ‘La Renardiere’ Pouilly Fumé is a delicious and fresh Pouilly Fumé that shows Sauvignon Blanc in its simply beauty and finesse. A lovely wine to sip on a warm summer afternoon as a prelude to an enjoyable meal. Also pair this wine with grilled whitefish. AGENT WHITE: Greetings, Arnaud. We are thrilled to be showing your wine today. Thanks so much for taking some time to answer questions for our Operatives today. WHITE: Was there a specific experience in your life that inspired your love of wine? ARNAUD: My great grandfather who was one of the first to plant Sauvignon Blanc vines in Pouilly-sur-Loire. He had a willingness to always improve quality through innovation and modern technology while taking into account what we have learned from past. WHITE: What wine or winemaker has most influenced your winemaking style? ARNAUD: The wines at Domaine Bouchié Chatellier is made exclusively by family members. The knowledge of viticulture and winemaking has been passed down from generation to generation from the beginning of last century. WHITE: Who do you make wine for? ARNAUD: We emphasize natural wines and enjoy sharing this work of art that nature gives is with those who love wines like we do. WHITE: In your opinion, what makes the Pouilly Fumé so special? ARNAUD: Our soils are silex or flint, we use the selection massale process of propagating sub-varieties of vines that are best suited to our vineyards. Also, the experience of four generations is present in our vineyards and our cellars. This is what gives our wines their uniqueness and character. WHITE: What is your objective each day? ARNAUD: We make authentic and natural wines but above all they’re meant to be enjoyed! · The location of the Domaine Bouchie-Chatellier in the Loire Valley can be seen in this satellite photo.